All artists are fans. It's a fact. 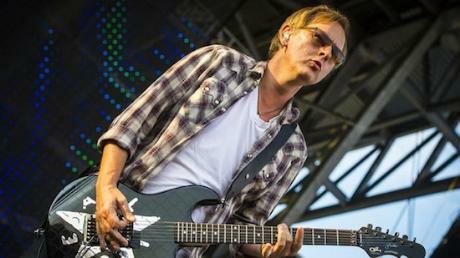 Nothing comes out of a vacuum and Jerry Cantrell is no exception to the rule. As his Baker's Dozen testifies, the leader and main guitarist of Alice In Chains was once a teenager playing air guitar to the sound of Van Halen. Of the thirteen albums, most were released between the end of the 1970s and the beginning of the 1980s, with Cantrell discovering them when he was in high school, living with his father, a soldier, stationed in Pennsylvania. "Both my parents were country music fans. That's what my house was filled with, not rock & roll, and I'm a big fan of country as well," says Cantrell. "I guess the first kind of rock & roll-type artist that I got into was Elton John. That kinda made me have an epiphany, like 'I wanna do that, I wanna be a musician, I wanna be in a band'. And when [I decided] I really wanted to be a guitarist was probably after listening to AC/DC..."
Founded in 1987 as part of the Seattle grunge screen, Alice In Chains have walked a long road. The death of iconic singer Layne Staley in 2002, could have killed the band, but Jerry Cantrell pushed for it to survive and in 2006, singer and guitarist William DuVall joined, giving the band a second life. The new line-up released Alice In Chains' fifth album, The Devil Put Dinosaurs Here, last month. "We've done a lot of things, lived a lot of life, we've made music that we are proud of", says Cantrell, looking back on the path the band have taken. Despite a voice broken from a cold, Cantrell talked the Quietus through his album choices, which range from the guitar god-touting classic rock of Led Zeppelin and AC/DC to the music of "friends and peers", like the aforementioned Eddie Van Halen.